Yamaha YPG-235 Review: It’s Affordable, But Is It A Good Keyboard? Would you like to own an affordable piano keyboard? Do you want an instrument that you can carry around easily, or hook up to software on your computer? 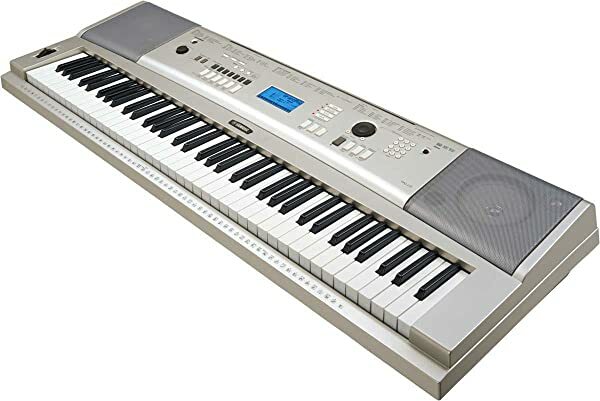 The Yamaha YPG-235 digital piano is an affordable, 76 key semi-weighted keyboard with dozens of uses. It is usually available for around two hundred minus accessories. This keyboard is not right for everyone. If you are a serious beginner or intermediate, you should consider a keyboard with 88 fully weighted keys. But if you are a simple hobbyist or parent, unsure about a big investment, this might be the instrument for you. Even a seasoned musician might be inspired by some of the useful features. The mere portability of this instrument is a big plus, not to mention the recording and playback functions, the variety of orchestral sounds, and the many rhythmic styles and sound effects. You could become a walking orchestra or theatrical sound man/woman with this one tool! The Yamaha YPG-235 is one of Yamaha’s “Portable Grand” models, and the most affordable. The keys are touch sensitive – most voices will get louder the harder you press the keys. They are also semi-weighted, using some weight in the touch but not like an acoustic piano. There are 489 different sounds, a 6-track recorder, educational features, and more. Also available for separate purchase are a bench, stand, power adapter, headphones, beginner books and a sustain pedal (recommended). In contrast, the next level model YPG535 has a full 88 keys, weighs 24 pounds, and comes with its own built-in, sturdy stand. Lightweight – only 18 lbs. The Graded Soft Touch (GST) action means that the lower notes require more weight from your fingers while the higher notes require less. This imitates the feel of a real piano which has heavier strings in the bass requiring more pressure. The keyboard is also touch sensitive – the heavier your touch, the louder the sound. This function is especially important if you are to make any kind of musical sound. The 76 note keyboard is limiting for a couple of reasons. You would not have the very low and high notes present on a traditional piano. The width of the keyboard is 1″ less than 76 keys would be on an acoustic, so each key is just a tad narrower than on a real piano. But neither one of these features is a real drawback if you are still a beginner. One drawback of this model is that it does not have weighted keys. On a typical acoustic piano, you REALLY need to use the weight of your arms and fingers to make a good sound. If students come to me who have only played on an unweighted keyboard, they can barely make a sound! Once their parents buy an acoustic or weighted key instrument such as the P45 88 Key Digital Piano, I notice a huge improvement. The YPG-235 is 46" wide, 16.2" deep and 5.3" high (minus the stand) and has an attractive champagne gold color. At only 18.3 lbs., it is more compact and 5.7 lbs lighter than the YPG-535. You can easily move the keyboard from place to place. A compartment for 6 D batteries means you don't have to worry about where to plug it in. The display of the YPG-235 is smaller than that of the YPG-535, but it shows your current settings such as the selected song, sound, tempo, mode, style, etc. It also shows the Song Lesson function - you will see the notes on the piano staff and the keys on a graphic keyboard as you play. The sounds on the Portable Grand are generated by digital recordings of real acoustic pianos – pretty good for a keyboard in this price range. The player's touch sensitivity controls the grand piano sample that is heard through the keyboard's AWM Stereo Sampling system. Although many different sounds are available, just one push of the convenient "Portable Grand" button will return you to the grand piano sound. The built-in speakers consist of a 2-way speaker system (6W + 6W amplifiers). They are more than adequate for home use or playing in small spaces. For larger venues, however, you may need an external amplifier. Although this Yamaha has a 32-note polyphony, meaning that only 32 notes can sound at one time, you are not likely to need more than this. If you are an orchestral composer or a pop musician who likes a big, complicated sound with lots of bells and whistles, you should consider a keyboard with a 64-note polyphony or more. But even with 2-layered stereo notes, if you use all 10 fingers (without a recorded accompaniment) you still won't need more than 20 voices at one time. In total there are 489 instrument sounds available on the YPG-235 including 6 piano sounds, numerous instrumental voices, and special sounds. These include "Sweet" voices of Soprano & Tenor Saxes, Trumpet, and Pan Flute, and "Cool" Voices such as Organ, Honky Tonk, Galaxy Electric Piano, and more. There are also 9 kinds of reverb (echoes), 4 kinds of chorus and 5 equalizer settings. If you are arranging a song for performance and you're just not quite satisfied, experimenting with these voices can give you just the sound you want. The Yamaha Education Suite (Y.E.S.) and Performance Assistant allow you to break down songs into individual components such as pitch and rhythm. Waiting mode will wait for you to hit the right note. Tempo mode will adjust the tempo to your speed as you play. Minus One mode allows you to play the whole piece and gives you a grade at the end. But these are not a substitute for a real teacher. At the very least, purchase a piano method book that takes you step-by-step. The Split mode divides the keyboard in half and allows you to play one instrument in the top half and another in the bottom. You can use middle F or change to a different point to divide the keyboard. The Dual mode allows you to layer two instrument sounds, such as strings and piano so that they sound simultaneously across the entire range of the keyboard. The YPG-235 has a 6-track MIDI recorder which allows you to record your performances on the internal memory in SMF format (MIDI). Changes to various instruments, tempos and notes can be made after completing the recording. This is one of my favorite features - you can record an accompaniment for another instrument so you can play along with that instrument. Or you can record a melody and then play it back while figuring out the guitar chords you want. The music library of this instrument includes 100 preset songs - 30 in-built songs plus 70 more songs on an included CD-ROM. In addition, the keyboard contains 373 KB of internal memory; connecting to a laptop or PC via the USB port will allow you to download MANY more songs as well! Like any digital piano, the Yamaha YPG-235 doesn’t need to be tuned, though you can still adjust the pitch of the entire keyboard using the Transpose or Tuning function. Transpose function will allow you to change the pitch of the entire keyboard in half-step increments. For example, if you can play a song in F major, you can transpose to C major without actually having to learn it in a new key. Although other musicians will usually tune to your keyboard, you might occasionally need to tune to someone else. In that case, you can fine tune the pitch in 0.2Hz steps. Jack for a sustain pedal. You will need an A to B USB cable, which is widely available for under ten dollars. Once connected, you’ll be able to exchange MIDI files with music apps such as GarageBand or Mixcraft and use the piano as a MIDI controller. A sustain pedal, just like the right pedal on an acoustic piano, is highly recommended and will enhance your piano playing experience. I recommend that you purchase one like this rather than the small rectangular hinged pedal that is typically offered. This is a highly useful instrument to have for a beginner on a budget, or as a second piano for a studio or family, as long as you understand the limitations I have described. Click here to find out more... and happy keyboard hunting!